A style of combat that seemed to try and combine what people loved about the combat in games like Zelda, with the slower paced decision-making of games like Final Fantasy. While the Mana series never got anywhere close in popularity to those two legendary series’, it gained a following that was apparently larger than my brothers and I crowded around our Super Nintendo. I didn’t realize that was the case until I saw the announcement that Square Enix they would be releasing a new version of the Japanese ARPG, but here we are with a remake being released on all major platforms. I never thought I would have the chance to relive this game, so I wonder how much of my fondness is seen through the rose-tinted lenses I put on when I think about Secret of Mana. The game that was delivered doesn’t disappoint my nostalgia aches, but it does just about nothing different from the version of Secret of Mana released several generations ago. This is perhaps the game’s greatest appeal, but also its biggest drawback. I absolutely love how many of the original sounds are still in the remake. 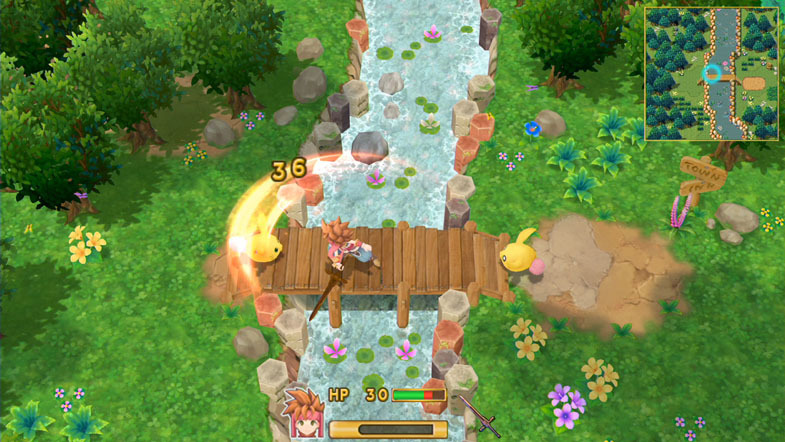 From the Square Enix logo screen accompanied by the computerized roaring tiger sound effect, to the menu beeps and boops, to the heinously loud shotgun blasts that occur every time you open a door or press a switch, if you played the 1994 Secret of Mana you’ll recognize the audio experience the moment you load up the game. Being able to switch the music from their remastered versions to the original soundtrack is an awesome little cherry on top. I ran into a not insignificant amount of bugs throughout my time with the game. With the way certain abilities will freeze one or all of your party members, I had issues where my characters would go to zero health but they wouldn’t actually die. All of their attacks would miss, and I couldn’t bring up any menus to try and start over, so I had to force-close the game. My biggest gripe with the game from a technical standpoint is the friendly AI in combat. There are times that my companions are just standing around, doing nothing in particular while I get wailed on by the boss, and other times where they’ve gotten stuck on a rock and are trapped into an endless running animation. Secret of Mana’s combat has seen no changes since the original release, which is an ongoing theme you’ll probably notice throughout this review. The combat is perhaps the worst offender in this regard. Back in its day, the way Secret of Mana paced combat was quite clever. Spamming attacks does you no good, as you’ll only do significant damage if you wait for a meter at the bottom of the screen to go from 0% to 100%. They combined this with an ability/equipment wheel that allows you to pause combat at any time to cast spells and change equipment. This really exemplified the Final Fantasy/Zelda hybrid they were trying to make. Fighting groups of monsters felt tactical but seamless, quick, and satisfying. Since then, of course, action-oriented RPGs have raised the bar quite a bit higher. Secret of Mana’s combat now feels like it struggles to get a proper rhythm. With damage and status effects being doled out to all three of your party members, I felt like too much of my time was spent babysitting my party, rather than coordinating with them. Still, the gear and ability progression is a satisfying journey of empowerment for all of your characters. This is what Secret of Mana did best originally, and the formula hasn’t gotten stale in this regard. 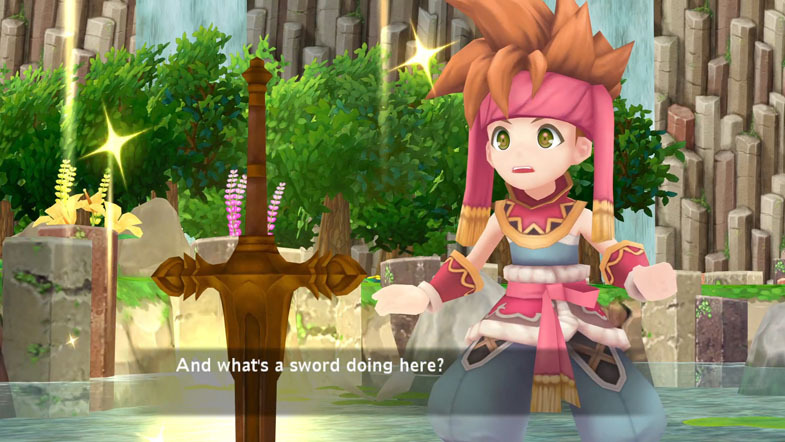 It would seem that the developers of this remake looked back at the old Secret of Mana game and said “the only thing missing here are fully voiced cutscenes” as that is, without question, their biggest addition of actual content to remake. The sprite sounds like Bart Simpson. It’s not a bad thing all the time, but when these characters get cheesy, they lay it on pretty goddamned thick. Some of the voice-acting itself is actually pretty solid, even if the writing probably should have remained in text. Dialogue can range from quirky and campy to brutally cringeworthy. Live voice acting being the biggest original content addition to the remake, this was a bit of a letdown. The letdown is exaggerated when you think about how much of the game could have felt fresh if it had been given even subtle tweaks from the base systems that worked so well on the Super Nintendo. It would seem that the bulk of development time was spent on updating graphics and putting voices to writing that wasn’t worthy of the spotlight in the first place. I really wonder what this game would look like if that focus were shifted to modernizing the Secret of Mana experience, rather than just its production quality. If you’re looking for a game with an old-school feel to it, then Secret of Mana still might not be for you. If you’re looking for something that genuinely feels old, then this Secret of Mana remake might be a good choice. In some ways it’s a classic experience, but in likely a few more ways it’s a dated experience. The plan at Square Enix may have been to bring their 1994 game into 2018, but the result feels much more like something from 2006. I wonder if the game would have maintained more of its charm had they stayed with the simplistic 16-bit graphical style, but fleshed out the systems within it to match today’s standards of intuitive menus, companion AI, and clearcut objectives. Maybe I’m just a hipster living in a retro fantasyland, but I think Secret of Mana (1994) is more visually appealing than the new version. I’m okay with my visuals looking a little dated if the gameplay experience still feels fresh, and that’s not really what’s happening in this particular remake. Secret of Mana (2018) makes for a nice jog down memory lane, even if there were some long-forgotten design flaws that years of nostalgic memories had blocked out over time. If you remember enjoying the SNES game, Secret of Mana holds onto many of what you liked about it back then. But if you’re looking for a polished, modernized version of the game, then you will be disappointed. For better or worse, not much has changed in Secret of Mana since its initial release in 1994.